Dairygold’s €86 million Nutritionals Campus in Mallow was officially opened on Friday 22nd at an event attended by An Tánaiste and Minister for Business, Enterprise and Innovation, Frances Fitzgerald TD, European Commissioner for Agriculture and Rural Development Phil Hogan and Minister for Agriculture, Food & the Marine, Michael Creed, TD. Following the investment, the state of the art milk processing facility is capable of producing the full range of nutritional dairy ingredient powders in volumes of up to 1,750 tonnes/week. 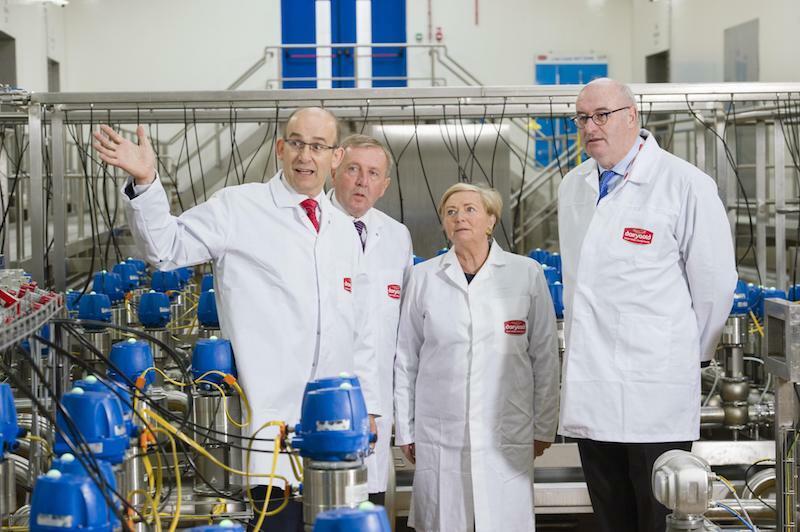 The Mallow Nutritionals Campus is a key pillar of Dairygold’s Expansion Plan to support the growth ambitions of its 2,900 suppliers across the Munster region. In 2012, Members forecast to increase their milk production by over 60% by 2020. Their forecasts have become a reality. Almost three years ahead of schedule, milk volumes from Dairygold’s 2,900 milk suppliers are expected to exceed 1.3 billion litres this year – a 55% increase on the baseline milk supply volume. Milk supplies in 2017 are forecasted to be up 105 million litres on 2016. This increase alone is worth an additional €39 million for the Society’s dairy farmers. Post quota dairy expansion has seen the creation of 112 full time jobs across the Dairygold organisation. The €86 million regeneration of the Mallow site has also had a positive impact on employment in the region. The development saw over 800 people employed through direct and indirect jobs linked to the project. It has also had indirect economic benefits allowing Dairygold suppliers to expand their milk production with the creation of additional jobs in farming and an increase in activity for businesses that supply goods and services to Dairygold. “Planning for this investment and Dairygold’s overall post quota strategy began years before April 2015 when quotas were removed. It was the foresight of the Board and the management team and their consultation with their ambitious milk suppliers that allowed the plan to be put in place so that this facility and the others in Mitchelstown and Mogeely can be here today to facilitate dairy farmers across Munster to realise their own farm expansion plan.